Again Simon Wright, the “Brain,” lives in a human body, and in that guise contends with the most hideous peril he has ever faced—a menace driving a planet to madness! The Captain Future saga follows the super-science pulp hero Curt Newton, along with his companions, The Futuremen: Grag the giant robot, Otho the android, and Simon Wright the living brain in a box. Together, they travel the solar system in series of classic pulp adventures, many of which written by the author of The Legion of Super-Heroes, Edmond Hamilton. 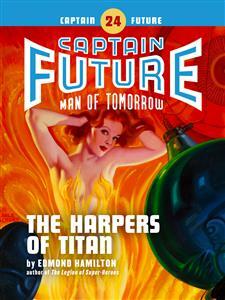 “The Harpers of Titan” was originally published in 1950. No part of this book may be reproduced or utilized in any form or by any means, electronic or mechanical, without permission in writing from the publisher. His name was Simon Wright, and once he had been a man like other men. Now he was a man no longer, but a living brain, housed in a metal case, nourished by serum instead of blood, provided with artificial senses and means of motion. The body of Simon Wright, that had known the pleasures and the ills of physical existence, had long ago mingled with the dust. But the mind of Simon Wright lived on, brilliant and unimpaired. THE ridge lifted, gaunt and rocky, along the rim of the lichen forest, the giant growths crowding to the very crest and down the farther slope into the valley. Here and there was a clearing around what might once have been a temple, now long fallen into ruin. The vast ragged shapes of the lichens loomed above it, wrinkled and wind-torn and sad. Now and again a little breeze came and set them to rustling with a sound like muted weeping, shaking down a rotten, powdery dust. Simon Wright was weary of the ridge and the dull-gray forest, weary of waiting. Three of Titan’s nights had passed since he and Grag and Otho and Curt Newton, whom the System knew better as Captain Future, had hidden their ship down in the lichen-forest and had waited here on the ridge for a man who did not come. This was the fourth night of waiting, under the incredible glory of Titan’s sky. But even the pageant of Saturn, girdled with the blazing Rings and attended by the brilliant swarm of moons, failed to lift Simon’s mental spirits. Somehow the beauty above only accentuated the dreariness below. He looked outward through a rift in the lichens, to the valley where Moneb lay—a city indistinct with night and distance, picked out here and there with the light of torches. Simon spoke, his voice coming precise and metallic through the artificial resonator. Otho nodded. Otho, the lean, lithe android who was so exactly human that only a disturbing strangeness in his pointed face and green, bright eyes betrayed him. THE manlike metal form of Grag moved impatiently in the shadows with a dull clanking sound. His booming voice crashed loud against the stillness. Poised, effortlessly upon the unseen magnetic beams that were his limbs, Simon watched and brooded. Only in a detached way could he appreciate the picture he presented to others—a small square metal case, with a strange face of artificial lens-eyes and resonator-mouth, hovering in the darkness. To himself, Simon seemed almost a bodiless ego. He could not see his own strange body. He was conscious only of the steady, rhythmic throbbing of the serum-pump that served as his heart, and of the visual and auditory sensations that his artificial sense-organs gathered for him. His lenslike eyes were capable of better vision under all conditions than the human eye, but even so he could not penetrate the shifting, tumultuous shadows of the valley. It remained a mystery of shaking moonlight, mist and darkness. It looked peaceful. And yet the message of this stranger, Keogh, had cried for help against an evil too great for him to fight alone. Simon was acutely conscious of the dreary rustling of the lichens. His microphonic auditory system could hear and distinguish each separate tiny note too faint for normal ears, so that the rustling became a weaving, shifting pattern of sound, as of ghostly voices whispering—a sort of symphony of despair. Pure fancy, and Simon Wright was not given to fancies. Yet in these nights of waiting he had developed a definite sense of foreboding. He reasoned now that this sad whispering of the forest was responsible, his brain reacting to the repeated stimulus of a sound-pattern. Like Curt, he hoped that Keogh would come soon. Time passed. The Rings filled the sky with supernal fire, and the moons went splendidly on their eternal way, bathed in the milky glow of Saturn. The lichens would not cease from their dusty weeping. Now and again Curt Newton rose and went restlessly back and forth across the clearing. Otho watched him, sitting still, his slim body bent like a steel bow. Grag remained where he was, a dark immobile giant in the shadows, dwarfing even Newton’s height.